The Pokémon Amie is a new feature introduced in Pokémon X & Y and utilises the game's 3D captabilities, along with the touch screen, to give you a level of interaction with the Pokémon never been seen before. 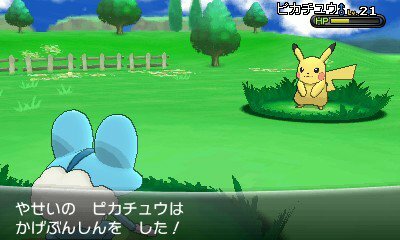 With this mode, your Pokémon can be brought into the fray for you to interact with them. This interaction ranges from feeding your Pokémon, to petting them and even playing with them. You can then mimic their movements and control them through the touch screen. 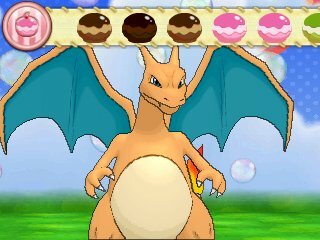 Feeding them, using the special food called PokéPuff, is done by holding the food in front of their mouth on the touchscreen. If you let go of it, it will drop down and the Pokémon will be disgruntled. You can also play games with the Pokémon. 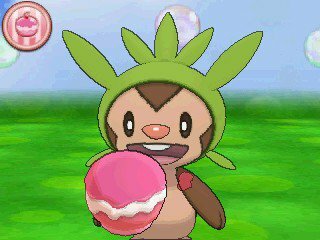 These games help you get special PokéPuffs depending upon your success. 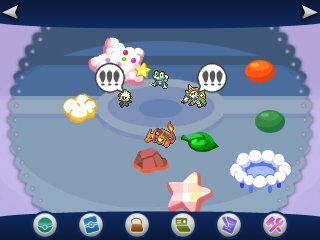 As you play with the Pokémon in Pokémon Amie, you will end up getting various decorations. Many of the decorations you get are related to the type of the Pokémon you have been playing with. These decorations can then be put out onto your Pokémon Amie screen, and decorated however you like. We'll provide a list of these decorations as soon as we can. On this screen, various other Pokémon will gather with your Pokémon to play. These Pokémon are in the Pokémon Amie of people in your Friends & Acquaintance list. In addition to that, as you move, your Pokémon will happily move along with you. When you play with the Pokémon, yoou have the ability to interact with them on the touch screen of the Nintendo 3DS. This allows you to pet them in order to increase their affection which can lead to certain affects in battle. However, each Pokémon has got certain parts which angers them if you pet it, such as Charizard's horns and Pikachu's cheerls, and bits which damage you, such as flames. In addition to that, you have the ability to feed Pokémon PokéPuffs. 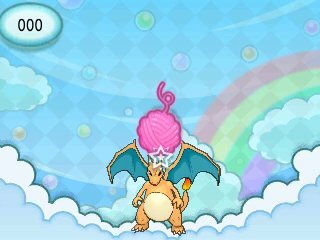 These are obtained by allowing other players to visit your Pokémon Amie page on the bottom screen, and as prizes for completing games. In the games, the higher the score, the better the PokéPuff. There are five PokéPuff flavours: Mint, Citrus, Mocha, Spice and Sweet, with each Pokémon having their own preference. This varies depending on each individual Pokémon, and not species. In addition to that, there are four different categories for each PokéPuff: Basic, Frosted, Fancy and Deluxe, which can be denoted by the various topings on the top of them. 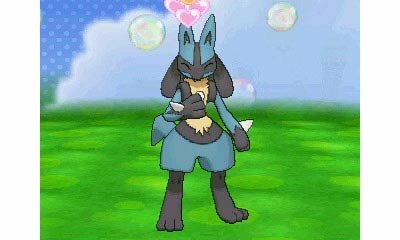 The better the category, the more affection you will receive from your Pokémon. Supreme Wish Get given it on your birthday. Supreme Honour Defeat the Elite Four. Supreme Spring Defeat a mini-game with 5 stars. Supreme Summer Defeat a mini-game with 5 stars. Supreme Autumn Defeat a mini-game with 5 stars. Supreme Winter Defeat a mini-game with 5 stars. Petting: If your Pokémon has high affection, you can pet it after it defeats a Pokémon by rubbing the touch screen. The mini-games are how you increase the Play stat of your Pokémon. Each mini-game has multiple levels of difficulty, with them raising the stat a little more with each difficulty. 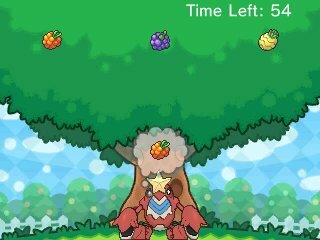 You get points based upon how fast and accurately you get the Berries to the Pokémon and how many Berries you successfully get to the Pokémon. This game has various Pokémon on the bottom screen as various balls of yarn fall down. Your task is to hit the balls back up with your Pokémon. This is done by touching the Pokémon as the yarn hits. As you do this without missing, you will gain combos. If you hit the Pokémon as the yarn hits, you get more points for each hit. This game has you complete a puzzle of your own Pokémon. The image you're creating is in a constant state of motion to make it even more difficult. The task is to complete the puzzle as fast, and in as few moves, as possible. The faster you do it, the better you do.